Spice up your spooky decor with a Halloween sign from Sawdust City! 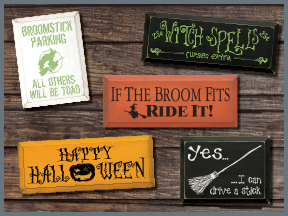 Our wood signs are perfect for greeting trick-or-treaters, adding to your Halloween decor, or just for laughs! Some of our signs are so funny you'll want to keep them up all year! With over 40 colors to choose from, your solid wood sign from Sawdust City will look great anywhere!